A stained glass picture of a priest baptizing a baby while the parents look on decorates this free, printable church holy card. 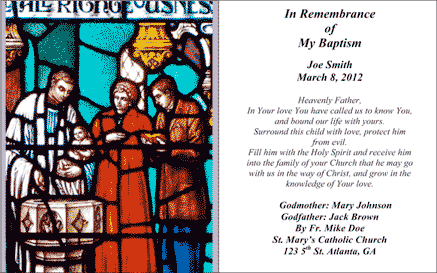 The other half of the insert carries the name of, date and place of the baptism to commemorate it. In Your love You have called us to know You, and bound our life with yours. Surround this child with love, protect him from evil. that he may go with us in the way of Christ, and grow in the knowledge of Your love.